"This is just like potato fried chicken, but I like to think of it as a little bit healthier!" Place melted butter or margarine in a shallow dish or bowl, then place potato flakes in a separate shallow dish or bowl. Roll chicken pieces in butter or margarine, then in potato flakes. 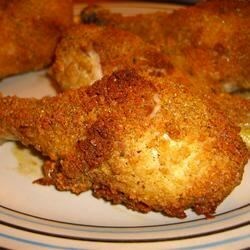 Place coated chicken pieces in a 9x13 inch baking dish, skin side up. Bake at 400 degrees F (200 degrees C) for 1 hour. Healthier - brush chicken with olive oil and then lightly roll in the potato flakes and it will turn out fabulous! Don't coat the potatos too thick it is crispier when it is a super light coat. My Mom made this when I was a kid - it was wonderful then and still simple and wonderful now. YUM!